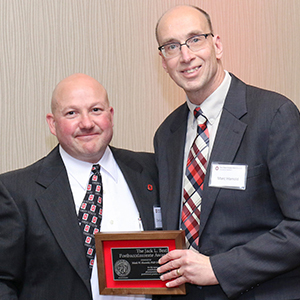 Columbus, OH – The Ohio State University College of Pharmacy is pleased to announce that Marc W. Harrold, PhD, has been awarded the college's 2016 Jack L. Beal Postbaccalaureate Award. The awards are presented to alumni of the College of Pharmacy who have made many outstanding contributions to the profession of pharmacy, in the fields of public health and public service, and/or promoting the activities of the college and its students. Ohio State's award recipients were honored at a gala. 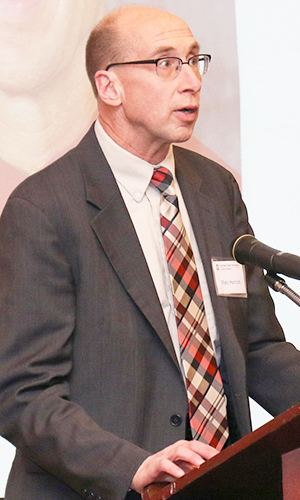 Harrold is professor of Medicinal Chemistry at Duquesne University's School of Pharmacy. He received his BS in Pharmacy from Duquesne and his PhD degree in Medicinal Chemistry from The Ohio State University. He joined the faculty at Duquesne in 1987 as an assistant professor and was promoted to the rank of full professor in 2002. Harrold has introduced a variety of teaching innovations into his courses, many of which have been published in AJPE, presented at AACP annual meetings, and have been used/adopted by other medicinal chemistry faculty. Harrold, along with Robin Zavod, has coauthored two textbooks: Basic Concepts in Medicinal Chemistry and Medicinal Chemistry Self Assessment. He has also been a long-time contributor to Foye's Principles of Medicinal Chemistry and several other texts.